Our Boca Raton Personal Injury Lawyers have represented hundreds of people that have been injured in both Boca Raton, Florida and throughout the state by no fault of their own. Our lawyers are available by appointment to meet with you at our Boca Raton office, your home, the hospital or at a location that is most convenient for you. In 95% of the Boca Raton, Florida accident cases that we handle our accident attorneys can tell you within a matter of minutes whether you have case. The best way to know if you have a case is to call us for a free phone consultation. Whether you are a Boca Raton resident or were injured in Boca Raton, our attorneys are available to discuss your recent accident. The city of Boca Raton, Florida is the largest city in terms of both population and area between West Palm Beach and Pompano Beach. The city has a rich history and vibrant cultural scene which includes several museums and art galleries. The Boca Town Center and the upscale Mizner Park area make Boca Raton a popular shopping and dining location. 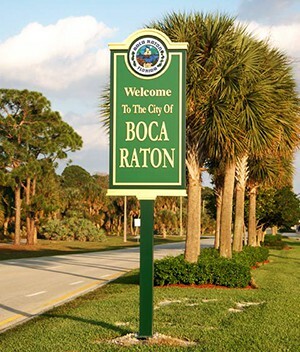 Boca Raton has a large amount of commuters whom rely on the highways and roads to get to work daily. Of the nearly 35,000 residents of Boca Raton of working age, 27,813 drive alone to work. This large volume of drivers often causes slowdowns and traffic accidents on the busy roads. Many residents rely on Interstate 95 to commute to work and back. In 2008 alone, there were 110 crashes which led to 125 fatalities on the Palm Beach portion of I-95 alone. Additionally, due to the temperate climate of Boca Raton, around 20% of residents are over the age of 65. Boca Raton is the home of a two mile expanse of picturesque beaches which allow for an active lifestyle, which include water sports, swimming, motorcycling, bicycling and other outdoor activities. At times, these activities can be dangerous and unfortunately, accidents do occur. As such, there are many hospitals to serve the population, including Bethesda Memorial and Boca Raton Regional Hospital.